Download TOFFEE-Mocha-1.0.18-1-x86_64 over HERE via Google Drive share. NOTE: If you are looking TOFFEE-Mocha WAN Emulator for Raspberry Pi2/3, you can find it HERE. 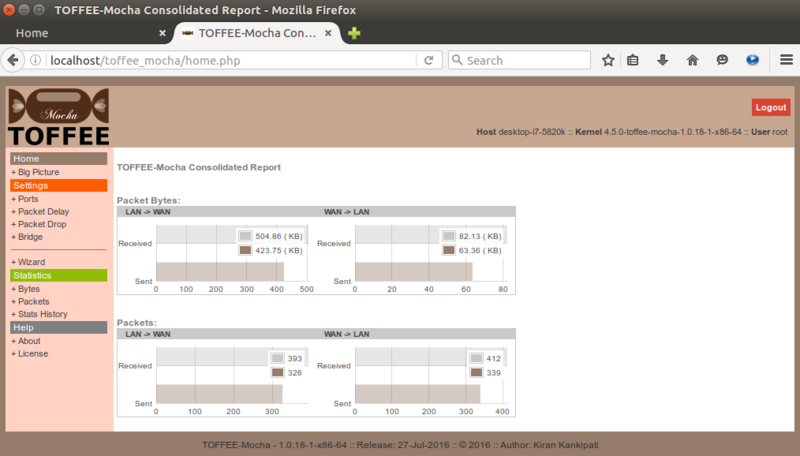 The TOFFEE-Mocha release is highly optimized and customized for generic x86-64 hardware platform. Once you extract the downloaded tar-ball you can find the pre-compiled binary files as well the source-code as shown below. 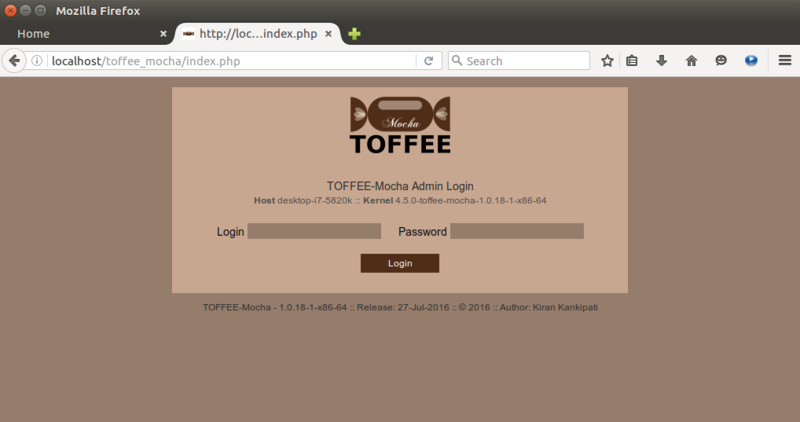 Installation TOFFEE-Mocha contains two parts namely web-based GUI and the custom Linux Kernel which contains TOFFEE-Mocha within it. So here are the step by step instructions you can follow to install the same. 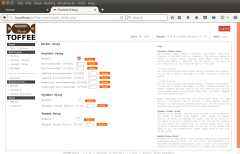 Step 1: Install the Ubuntu 16.04 LTS Desktop (64-bit) on a fresh system. Failed to stop toffeemochad.service: Unit toffeemochad.service not loaded. NOTE: Ignore any warnings and in few cases even any errors displayed. Once it is done, you can reboot the system, boot in the new TOFFEE-Mocha Kernel and can configure and use the same. Once you are done with Installation, you can restart the system and configure the same as shown below. Once you login you will get this first HOME page. 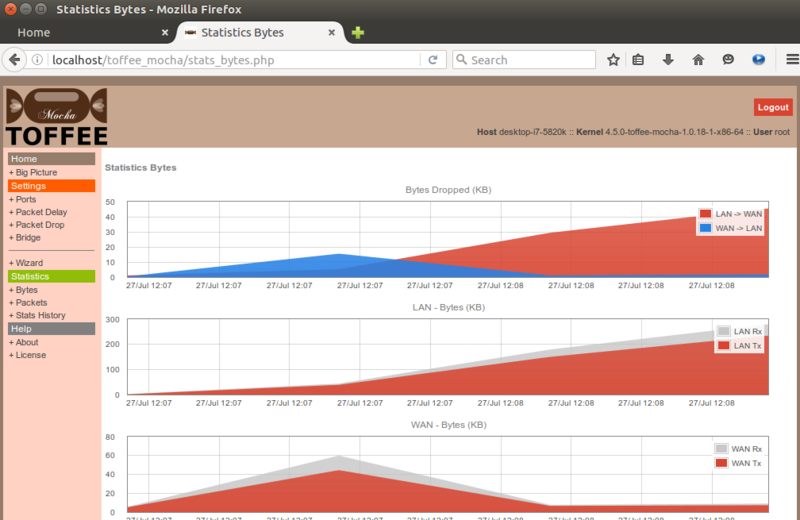 Since it is not yet configured and not yet active, there are no graphs populated in the home page. You can now configure TOFFEE-Mocha directly via Wizard by clicking "+ Wizard" on the side menu bar. Once you get the Wizard page, you can now select "Start" button. This button will reset everything and prepares for a fresh configuration. IMPORTANT NOTE: Since TOFFEE-Mocha device is a WAN emulator device you can configure any port as LAN port and WAN port. 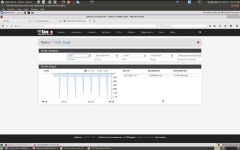 Swapping LAN and WAN ports in your deployment will not cause any issues. Select your WAN Port. As suggested in the note above, you can configure any port as WAN port. Now your TOFFEE-Mocha basic setup is over. Now you should get the confirmation page as shown below. Optionally you can now check various tabs under the Settings tab. For example the "+ Ports" tab shows the status of various network ports and its corresponding Direction (such as LAN and WAN) and other generic port related information. Sometimes you can directly set port direction via this page, but it is highly recommended to use the TOFFEE-Mocha Wizard. 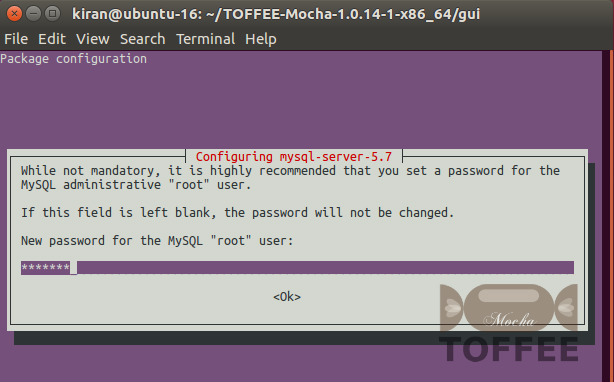 NOTE: TOFFEE-Mocha works within Linux based Layer-2 bridging module. And hence once TOFFEE-Mocha is configured via Wizard you should able to see the bridging port name as "toffee-mocha" as shown below. This bridging interface is created by the user-space TOFFEE-Mocha daemon automatically so that the Kernel-space TOFFEE-Mocha hooks, intercepts and optimizes the packets passing through standard Linux kernel bridge. Packet Delay Feature: As the name says you can add constant or dynamic packet delay on each packet passing through TOFFEE-Mocha. This will simulate slow speed WAN links. This will limit the rate of packets there by indirectly controlling the rate of bits-per-second data transmission. 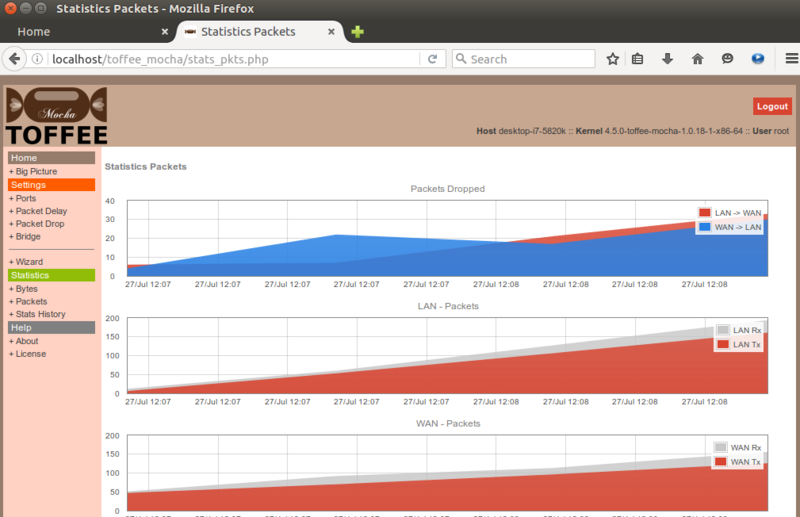 As one can understand this gives more finer and precise control over packets than the standard Linux QoS tc scripts. You can add inter-packet milliseconds and microseconds constant delay. As well you can add per-packet dynamic delay based on the size of the packet (i.e delay proportional to number of bytes per packets). Dynamic delay rate can be controlled by the dynamic delay factor variable. Dynamic delay is a unique feature through which you can simulate a kind of burst type traffic and so latency associated with the same. In any case you can use combination of both dynamic and constant delay parameters. 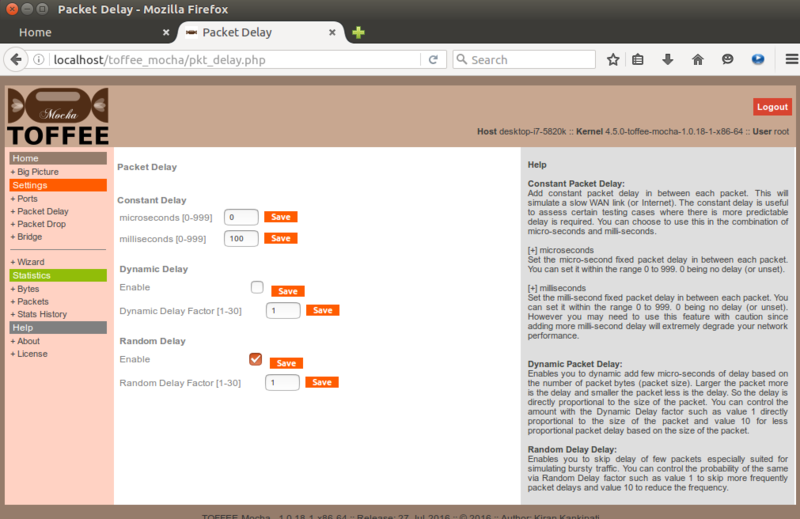 The overall delay of the packet will be the total delay set by all these settings. You can also skip delay of few packets randomly via Random Delay feature. NOTE: For more details kindly refer Help embedded within these individual settings pages. Packet Drop Feature: As the name says you can randomly drop few packets passing through TOFFEE-Mocha. This will simulate real worst-case WAN network scenarios such as mobile internet (3G/4G networks), Satellite Networks, in-flight WiFi, marine internet, etc. You can control the packet drop rate with the random packet drop factor variable as shown below. The value 1 denotes 1 in every 10 random number range. And 2 denotes 1 in every 20 and so on. So higher the drop factor lesser is the probability of packets getting randomly dropped. NOTE: Packets dropped this way will reflect in the TOFFEE-Mocha stats. 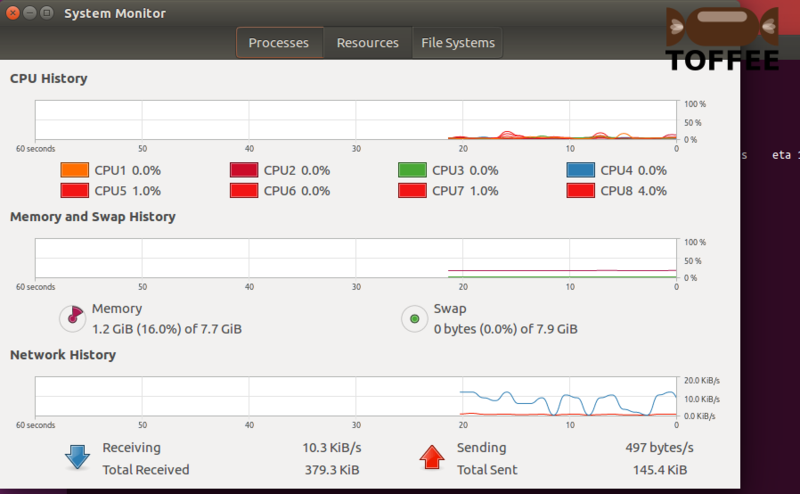 You can see the bytes and packets received vs transmitted in the stats. As well the overall stats reports in the first TOFFEE-Mocha home page. 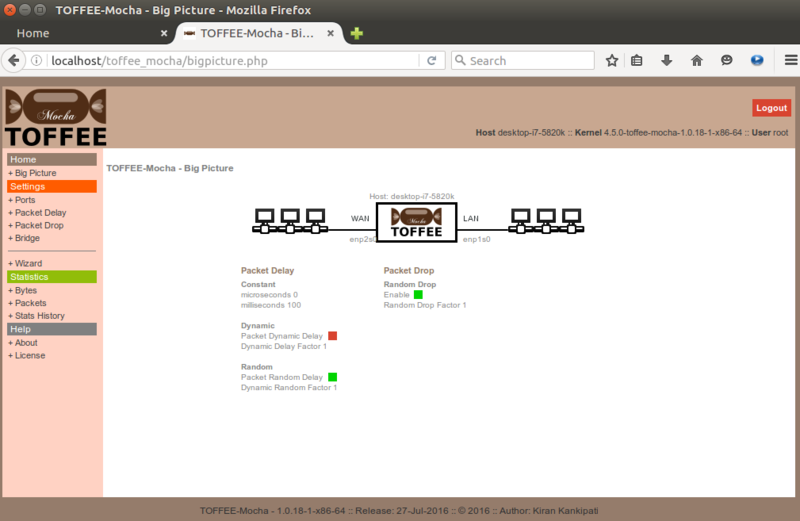 TOFFEE-Mocha Big Picture: You can view and confirm your settings via "+ Big Picture" any time. 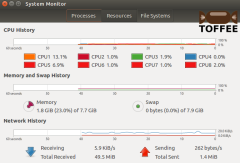 Big Picture is a neat graphical illustration of your overall TOFFEE-Mocha settings. You can view any time as a reference and even print and file it as a record if you are a Network Admin. You can assume big picture is a kind of graphical variant of a typical CISCO Device show running-config (show run) command output. 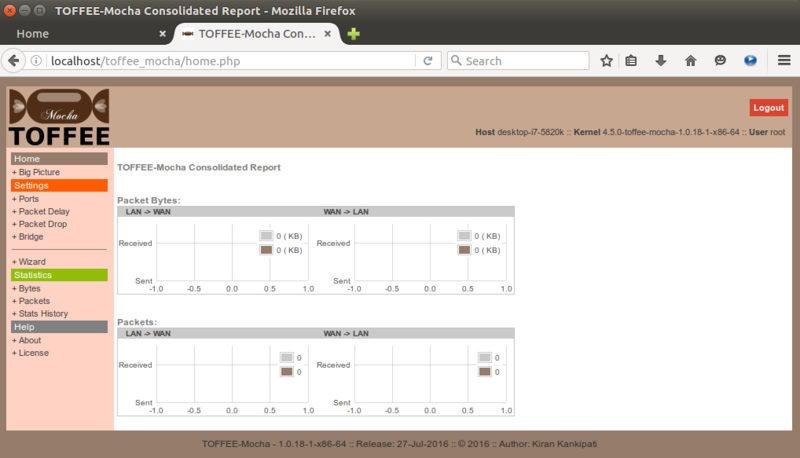 TOFFEE-Mocha Sample Deployment and Tests: Here is my HP-Laptop and Dell-Laptop connected via TOFFEE Mocha device. I did few ping tests and wget HTTP file downloads on my HP Laptop by accessing remotely connected Dell-Laptop via TOFFEE-Mocha.